"From now on nutrition will be considered one of the best yogas there is, although it has never been mentioned anywhere. All the other yogas - Raja, Karma, Laya, Jnana, Kriya, Agni Yoga - are magnificent, but it takes years to obtain the least result, whereas with Hrani Yoga (that's what I call it) the results are very quick. This is the easiest and most accessible yoga; all creatures without exception practise it, although unconsciously for the moment. 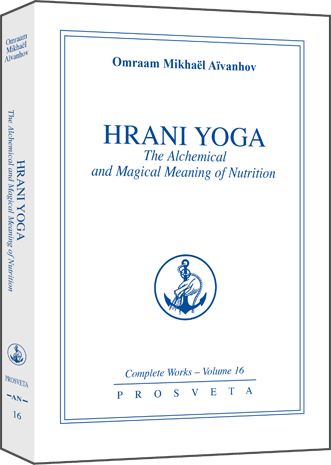 All alchemy and magic are contained in this yoga, which until now has been the most underrated and the most misunderstood. It is unbelievable that even intelligent people have never realized the secrets hidden in nutrition." In this quotation the Western philosopher, educationalist and spiritual master Omraam Mikhaël Aïvanhov (1900-1986) points to an opportunity for spiritual growth which has been overlooked by most of us. Maybe because eating is too much a part of our daily life; and what can we learn by eating?... Not so much what we eat, but how we eat is essential here, although the quality of our nutrition can become an important aspect in the quality of our life. Most lectures about the profound meaning of nutrition in our lives are contained in this new book and it is certainly of great importance these days! Nowadays food is of interest to everyone. People eat too much and too fast, and it starts with children. We admire Jamie Oliver; the way he tries to mobilise consciousness in schools for wholefood. Young girls compete with each other in starving themselves. Idols go to health resorts for a few days, and in Holland we can witness on television the purification of their intestines, alongside their efforts to fast. The media deluge our minds with miracles, achieved by the practice and methods of diet gurus... It is a good thing that the effect of food on our body and our mind is being brought to the public's attention. Many are inspired by that to work on their weight, their physical condition or their psychic state. Indeed, nutrition offers unknown possibilities and this article will encourage you to go much further, deeper. Who will take the opportunity to concentrate, at mealtimes, on the food itself and accomplish an inner work with it? "Food is a love letter sent by the Creator that has to be deciphered. In my opinion, it is the most powerful, most eloquent love letter, as it says to us, "We love you ... here, we are giving you life, strength ..." More often than not, humans swallow everything without deciphering any of this letter ..."
"after 11 a.m. ...when the labour of the forenoon regularly (was) terminated, all of them again assembled together, had a baptism in cold water, put on their white garments, the symbol of purity, and then made their way to the refectory, which they entered with as much solemnity as if it were the temple. The meal was a common one; and each member took his seat according to the order of age... A mysterious silence was observed during the meal, which had the character of a sacrament... (after the meal they dressed themselves in their working clothes and resumed their several employments)." This quotation from the famous essay by Christian Ginsburg (1864) describes the role of the meal in the daily schedule of the Essenes (an important Gnostic movement in Palestine around the period in which Jesus lived. There are several written testimonials, as from Philo, Pliny, Josephus etc. Flavius Josephus asserted that the Essenes "live the same kind of life which among the Greeks had been ordered by Pythagorus"). Because of this, some writers believe that Essenism is the offspring of Pythagorism. Nowadays we can read that probably Jesus' parents were Essenes as well. Anyway, in the above quotation the opposite of what is presently considered by many as 'normal' can be seen. However, in the spiritual movement of the 'Universal White Brotherhood', which Omraam Mikhaël Aïvanhov introduced in France in 1937, the silent meal as a spiritual practise has a very important place. "At mealtimes we must begin to learn control and mastery. So, practice eating without making any noise. I know that what I am asking you seems almost unbelievable and unachievable, but you will succeed, and all those who come here will be astonished. They'll say, "But it's not possible, I can't believe my eyes!" And I will reply,"Well, at least believe your ears!" Here, Aïvanhov underlines the natural, the ordinary in everyday life, where silence should have its place to increase our quality of life, and the healing contribution of the meal when eaten consciously and in silence, if we concentrate and harmonise ourselves inwardly. At the same time, during the days meals, we are being tested on our ability to step back. If we succeed, the reward is great, psychically as well as spiritually. As with meditation, these results are even multiplied, if done together with others. "The most important moment of any action is the beginning, for that is what releases forces, and these forces do not stop halfway but continue to the end." The most complicated production processes usually start with the pushing of one single button, which sets everything in motion; after that, however, one is forced to let things take their course. That's the reason why, at the start of a meal, the quality of one's thoughts are of great importance. And what are the images you project? Are you willing to realise that, with each mouthful, you do not just dump something in a black hole? That you work together with many subtle elements and with very intelligent beings, who, first in the mouth and then in the stomach, transform the food into energy and effective building blocks? Besides right thinking, chewing well and breathing consciously are essential in this process. After that, this energy and this effective material can be transported to the seven bodies from visible and material to invisible and ethereal. As our mobile phone uses power which is subtler than the engine of our car, so in our body a hierarchical process takes place, in which develops a complex succession of production, distribution and consumption. However, in society we take a lot of care in the development and maintenance of computers and machines, the hardware as well as the software. The idea that inside us an analogical process takes place, is something that most humans only realise when it's too late... For those who realize this in good time, a whole new potential of strengthening psychic and spiritual growth opens its doors. In fact, by eating consciously you start a healing process. During every meal we can again nourish our nervous system, the brain cells, the veins, but also our soul, our intuition and the spirit, with the help of our thoughts and imagination. If we direct our consciousness to it, the meals can give us the gift of plenitude. However, it does this in a way which is completely different from what we normally associate with eating. "So, when you eat, forget your worries, your bitterness, your negative thoughts, which poison the food and make you ill; link to the angels of the four elements. Say, "Angel of earth, angel of water, angel of air, angel of fire, give me your qualities of stability, purity, intelligence and divine love", and in this way you will evolve, you will become more enlightened, you will become nobler." With regard to one of the most important issues of our life, eating, Aïvanhov shows concisely, that the intention of how we eat not only connects us profoundly with nutrition, but also establishes an all-embracing affinity with the universe. Those with a spiritual practice project, transform and achieve continuously; thoughts are being projected in images on the serene surface of the lake, their soul, their own inward reality. The common reality of the outside world will be 'clothed' with it, because our behavior, our attention, our communication and connection with others will improve enormously. All other beings, visible and non-visible, will be attracted to it like a magnet, like a flower attracts the bees by its colour and fragrance. This state can be practised for only a few seconds and, later, minutes while eating. You can develop it for the length of a whole meal and at other moments in the day... until you live the full and rewarding life of an alchemist and magician! In esoteric tradition our body cells are considered as intelligent subjects who know how to make effective use iof average physical exercise, normal breathing and a normal diet. The challenge ahead is to be found in our consciousness, in the intention, the way in which we say and do things. If we succeed in raising our eating to a higher level, not only will that be a great victory over ourselves; we will also sow the seeds for natural spirituality in our collective life. During our daily meals we can fulfill our role as alchemists; then we can reinforce the light in ourselves and keep darkness at a distance. Do you cook for yourself? Do you bake your own bread? Do you grow your own vegetables? Even better, because right there you can start to link yourself with Cosmic Intelligence. Do you begin your relationship with food when you start to eat it? Then start with a prayer or mantra that blesses this food, and speak out (short but explicitly) your recognition for this gift of life force. Next, connect yourself in silence with the food, for some seconds, and cherish an image, that right at this moment comes up in you, about the enormous labour, done by Cosmic Intelligence, to deliver it to you. Imagine the beneficial journey the food will make before it reaches your cells, a journey during which the food will be assimilated, and from time to time heated by the fire of a conscious deep breath. Enjoy the fragrance and the taste of a fruit, bread or a vegetable, and be conscious of how splendid life itself is, despite all that can happen within it. 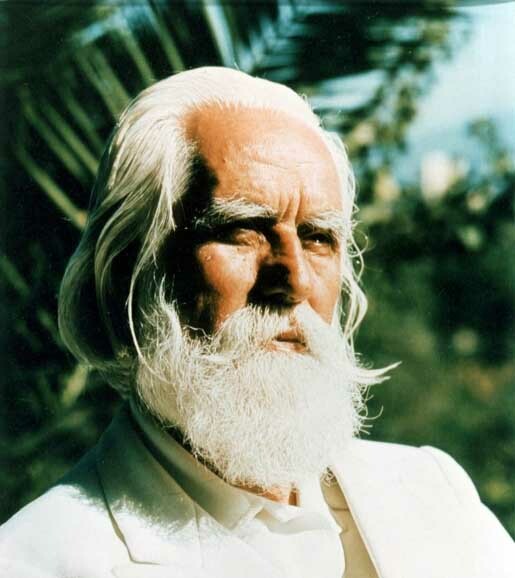 Aïvanhov goes much further in his vision using food as a means for spiritual evolution. Initiatic Science tells us that, the more a being has progressed on the ladder of evolution, his or her food will be of a more subtle nature. So light is the most supreme food in the universe. The Zoroastrian tradition tells us that when Zarathustra asked the God Ahura Mazda what the first humans fed themselves with, he received the answer; They ate fire and drank light." "That is why, during meals, through our thoughts and feelings, we can prepare the best conditions for finding the materials that will build our body of glory." Because of this, Aïvanhov invites us, during spring and summer, to go at dawn to a quiet place in nature (or, if that is difficult, on the balcony!). Around that time of the day the ethereal 'lightforce' is at its strongest. Than we can 'eat' the light particles by linking ourselves to the sun in order to build that body of light, which is also called the Body of Glory.